To receive this designation, a wine must be rich, concentrated and likely to benefit from extended aging. Our estate vineyard’s upper block, with fruit that was denser and more concentrated, earned the honor of this title through farming practices of smaller canopy, lighter yield, and picking at a more advanced stage. Embodying the core of the Flagship label, expect this wine to cellar gracefully and to develop over the next 5 to 15 years. This wine combines the nuanced expressions of a few select sites in So. Oregon’s Rogue and Applegate Valleys. Dark fruit and roasted aromas overlaya silky smooth texture with a long, supple finish. 4-2,A (or “fortooay,” think Cabernet , Chardonnay , Viognier) was coined by our daughter, Margaux as the varietal name she gave to her own impromptu blends of water and juice. Of all the varieties at Mae’s Vineyard, the Syrah has been the most consistent. Essentially, Mae’s Vineyard Syrah shows notes of very pure dark fruit with a distinct balance between tannin and acidity. This vineyard lies next to the Applegate river with coarse, rocky soil. This is the coolest, most moderate site in our portfolio. Graceful, spicy and elegant, it epitomizes the softer side of Syrah with firm structure and refined balance throughout. Located in the Southern part of the Bear Creek Valley, at 2000 ft of elevation, this steep, south facing vineyard always develops richness and mid-palate depth, even in cooler years. Peppercorns, roasted meat, and roasted herb notes predominate creating a complex nose yet rounded palate. Grenache is such a transient grape variety. It’s hard to pin down, finding its way into many different styles of wine. What then, should its place be here in So. Oregon? At this point, what our Grenache does make are juicy, low tannin, high fruit wines that are highly versatile, popular, and, frankly lots of fun. These are the wines served alongside cuts of Serrano ham and hard cheeses in Spain, and the wines consumed daily by the everyman of So. France along with his ratatouille, aioli or pesto. A New World version of the French classic “Rhone Blend.” Grenache acts to soften the more tannic Syrah, while Mourvèdre adds backbone and a unique “gamey-ness.” This is a versatile wine capable of accompaniment to many different dishes. Spicy aromas with notes of clove, black pepper and currant. Mae’s Vineyard is our Estate Vineyard lying in the middle of the Applegate Valley, just west of Ruch. The Cabernet Franc block is on South East facing slopes, planted on red, stony, Manita soils. Mae’s vineyard Franc has a unique tasting profile that includes tobacco, mint, cocoa, earth and leather. Jim and Sierra Castellano planted their vineyard in 2006, the same time as our own and only a few miles away, on a steep South West facing hillside high above the valley. Castellano Franc is defined by a rugged quality. It is more structured and tannic than Mae’s with notes of leather, red pepper and spices. Applegate Valley Cabernet Franc is one of the foremost examples of the variety. This vintage shows notes of coffee, black cherries, grilled meat, and a smoky character typical of the vintage. Our bottlings are barrel aged in French oak for 18 months and built for long term cellar aging. Enjoy over the next 5-15 years. We reserve the Arsenal label for the vintage’s best blending effort concerning our beloved Cabernet Franc. The right bank Bordelaise marriage of Cab Franc and Merlot has continued to shine in this vintage to create a wine with ample structure, texture and aromatic complexity. Rich with cocoa, tobacco, loam and mint, this is a wine made for further aging. "La Battalla" is our blend of Cabernet Franc (75%) and Malbec (25%). It is bright, fruit driven, with a spicy note. Easy to drink and great with food, it shows the versatility of Cabernet Franc. The label features "Don Nato", our fictional Francophilic freedom fighter. Don Nato fights for the freedom of Franc against a wine world dominated by the Sauvignonistas. 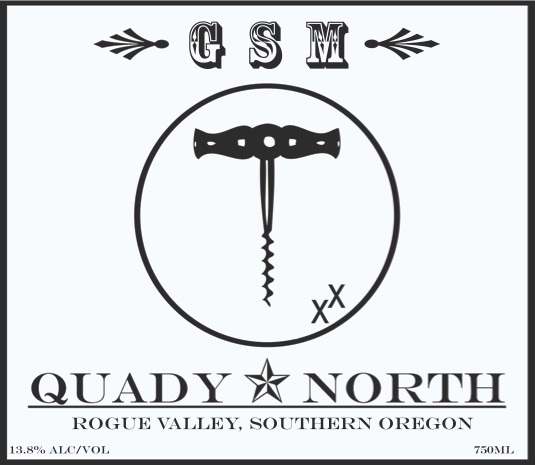 At Quady North, we specialize in small lots of Viognier, Syrah and Cabernet Franc from select sites in Southern Oregon’s Rogue and Applegate Valleys. So what do you do when you produce an outstanding barrel of Merlot? Not that this wine is Merlot… This is 5% Cabernet Franc with another red variety blended in. Aromas of cedar plank and chocolate lead to a velvety texture framed with enough tannic structure to go the distance.